We admit it — we took a little summer vacation. (How did summer go by so quickly?) But we are now re-engaged and energized to register voters in advance of the November midterms. 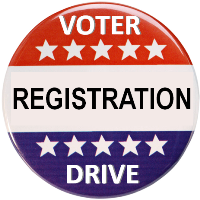 Remember: October 12 is the registration deadline for new voters. Let’s hit the streets! We’ll be looking for volunteers to help us during these events, so please stay tuned for more information. We’ll be creating individual events on both Facebook and Action Network that will allow RSVPs for volunteer shifts. We’ll keep you posted on this site, too. We have an experienced team, so if you’re new to registering voters, don’t be shy. It’s fun and easy and a great way to engage with the community. Welcome to a new year of activism, hope and opportunity for change. The NY23 Votes team is rolling up our sleeves to get out the vote for the Midterm elections, to register voters, and to promote civic engagement in the 23rd District. This is the year that we hold Congress accountable to the people, and the grassroots organizing that you all have been doing is what is going to make that possible. We have a slate of activities in the works for the months ahead, including canvasses, phone banks, tabling, festivals and events, training days, and more – we hope to hear from you if you have other ideas and plans. Many thanks to those of you who filled out our poll, we really appreciated the feedback, validation, and new ideas, and will be reaching out to folks who expressed interest in getting involved in specific activities. As 2017 comes to an end, we are anxious to think through our strategies for 2018. And we want your input! We would be most grateful if you would take this short survey. This will help us understand how we can be most effective in the months leading up to the midterm election. It will also help us understand where your interests lie as well as the breadth of our volunteer base as we beginning scheduling voter registration canvasses and other activities. Thank you for the taking the time. We really appreciate it! Ithaca Canvass – November 5 – Join Us! Election Day — Tuesday, November 7 — is right around the corner. We’re organizing a quick GOTV (get out the vote) canvass in Ithaca for Sunday, November 5. Come help us make a difference by making sure our friends and neighbors know when and where to vote and what they’ll be voting on. And of course we will also be registering new voters! We’ll be adding to the voting base in this district, building our canvassing and organizing skills, and connecting with like-minded folks. If you have never canvassed before, we encourage you to give it a shot – it is one of the most rewarding activities in our civic playbook – a chance to roll up your sleeves and connect with your fellow citizens and offer them a helping hand. If you have canvassed before, come out and help show a friend the ropes! We hope you will join us for this special canvass day as we build the civic engagement in our district! September 24 canvass – join us! For our next major community-wide action, we invite you to join us on Sunday, September 24 for a coordinated effort across the district to get voters engaged and informed. providing some information on an important ballot item regarding the Constitutional Convention in New York.